Speaker of the House Rep. Todd Richardson, center: "We will not avoid doing what is right just because it is hard or just because it's not the path we hoped to travel." Leaders of the Missouri House and Senate made the announcement late Thursday that they had 138 House and 29 Senate signatures for a special session to consider disciplining Greitens. That exceeds the 3/4ths of legislators needed to call the legislature into special session. The special session will begin on the evening of May 18, the last day of the regular session. That will give the legislature a chance to deal with the question of impeachment for at least 30 days. It will also, as House Speaker Todd Richardson noted, give a House committee charged with investigating the governor time to finish its work. “I had hoped from the beginning of this process that the committee would find no wrongdoing so we could bring this investigation to a close and put all of our attention on the issues that matter most for Missouri families," Richardson said. "Unfortunately, this is the where the facts led." "We will not avoid doing what is right just because it is hard or just because it's not the path we hoped to travel," he added. Democratic lawmakers have been pushing their Republican colleagues for weeks to begin the impeachment process as soon as possible, and some did not sign the petition because of the delay. But the party's leaders in both chambers seemed pleased with the special session. "Eric Greitens should have resigned weeks ago," said Senate minority floor leader Gina Walsh, D-Bellefontaine Neighbors. "Unfortunately, he has refused to do the right thing. 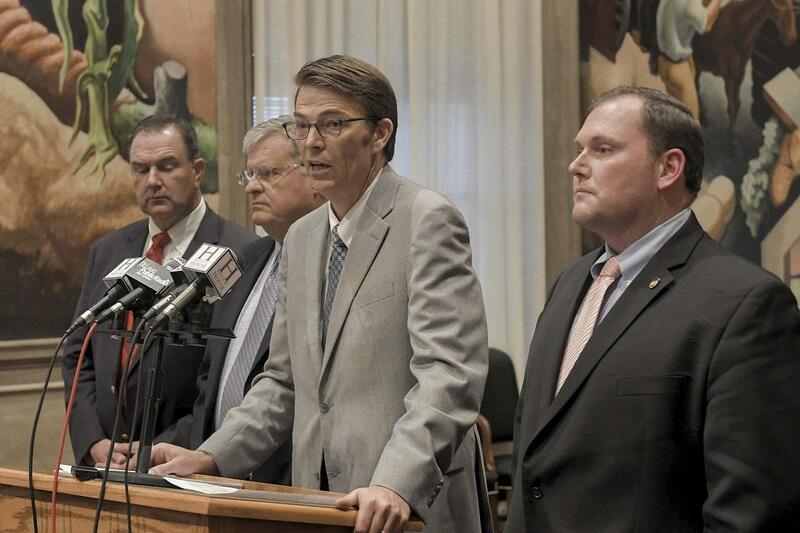 That's why members of the Senate Democratic Caucus have joined our Republican colleagues in calling the Missouri General Assembly into Special Session immediately following the conclusion of regular business to consider the impeachment of the governor." The House minority leader, Gail McCann Beatty, D-Kansas City, said the governor's alleged crimes and his refusal to do the right thing and resign had made the impossible act of collecting enough signatures to call a special session possible. "The House investigative committee has done outstanding work to date, but as we near the end of the regular legislative session, it is clear the committee needs additional time to finish building its case and prepare articles of impeachment for the House to consider," Beatty said. "Pursuing impeachment against a Missouri governor is history none of us wants to make, but Eric Greitens' actions have made it unavoidable." Greitens was charged in February with felony invasion of privacy. He’s accused of taking a photo of a woman he had an affair with without her consent. A startling House committee report released last month painted Greitens as sexually and physically abusive toward the woman, charges that the governor strongly denies. The governor was also charged with felony computer data tampering for obtaining a fundraising list from the Mission Continues — and using it to raise money for his 2016 gubernatorial campaign. This week, a House report alleged that a key Greitens aide, Austin Chambers, misled former staffer Danny Laub to take the blame for the situation. A spokesman for Greitens did not immediately return a request for comment. For Greitens to be impeached, a majority of House members would have to vote for such a move. That equals 82 votes. If that happens, then the Senate will select seven judges to decide if Greitens violated aspects of the Missouri Constitution. While state statute says a person impeached is suspended from their duties, an attorney for Greitens indicated previously to the Springfield News-Leader that he would fight that temporary removal from office on constitutional grounds. The announcement marks a stunning legislative fall for Greitens. Never before had a Republican governor entered office with so many Republicans in the Missouri General Assembly. That gave Greitens an unprecedented opportunity to enact longstanding GOP priorities. But relations between Greitens and the GOP-controlled General Assembly soured, even before he admitted after his 2018 State of the State address of having an extramarital affair. He went after state senators by name for not voting against a pay increase. A politically-active nonprofit that his campaign staffers ran attacked lawmakers like Sen. Rob Schaaf, R-St. Joseph. And the governor likely angered many when he compared lawmakers to third graders for not passing enough bills in 2017. Greitens faced an uncertain political future days after the affair became public. But he’s vowed to stay in office for months. He even dubbed the aforementioned House report on his conduct a “witch hunt,” and attacked the process to possibly impeach him as unfair. Since January, numerous Republicans that previously supported Greitens have called for him to step down — including Richardson and Richard. Richardson commands bipartisan respect, so it’s likely that he’ll be able to convince at least 82 lawmakers from both sides of the aisle to impeach Greitens. "As a student of history, I recognize the monumental effort and the consequences of this action," Richard said. "We do respect the process. I do believe the speaker is right that extra time may be needed to make sure all the facts are found." Have a question about the Greitens case? Ask it here and we'll pick questions to answer on the Politically Speaking podcast.